Unico National says Italian Americans are the only group in the U.S. for which "overt stereotyping" continues to run rampant, which is why it plans to continue its protests of Mafia II. 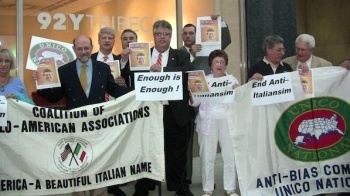 The Italian American organization Unico National made a couple of gaming headlines last month, first when it accused Take-Two's Mafia II of being "a pile of racist nonsense," and then later when members of the group staged a protest outside of the game's launch party. Despite the assertions of Unico's Andre DiMino that its actions resulted in the "dismal failure" of the launch party, it's safe to say that most gamers weren't even aware of the protest and that among those who were, the reaction was one of befuddlement. Why protest a historical fact? "There is no denying that, in the period portrayed in Mafia II, there were Italian Americans in organized crime - but, the problem is, that it was not the exclusive domain of Italian Americans, as is constantly portrayed by the media," a Unico representative explained in an interview with Paranerds. "It is this constant and unrelenting exhibition of Italian Americans in the mob that creates the stereotypical perception that it is a unique characterization of only Italian Americans. "During this period there were plenty of murderous thugs and criminals in organized crime that were not Italian American," he added. "But that is not what is portrayed." The rep made a point of stating that Unico objects to any and all forms of stereotyping, but claimed that Italian Americans face unique abuses. "It is painfully apparent that Italian Americans are the ONLY group in America where overt stereotyping is so rampant in today's society," he said. "It is now not politically correct to use pejorative terms or stereotypes about other ethnicities, religions or races. But, on a daily basis, we find Italian American negative stereotyping and defamation in many venues." Unico's efforts are not focused on games specifically, the rep said, pointing out that its campaign against the MTV reality show Jersey Shore resulted in the elimination of Italian American references and stereotypes from the show's second season. But games are of special interest because of the impact they have on young children, who, the rep claimed, will inevitably get their hands on them. "What does concern us greatly is that a videogame WILL be played by young people, including teens and pre-teens - regardless of the M rating (which probably makes it more enticing for young people to want to play it! )," he said. "This means that a whole new generation will be exposed, for hours-and-hours and days-and-days, to the perception that it is ONLY Italian Americans who were murderous thugs and criminals in organized crime. This is not an appropriate perception that should be implanted into the subconscious psyche of young people." Mafia II is out now for the PC, PlayStation 3 and Xbox 360. Thanks to Vault Citizen for the tip.